AMID the daily drumbeat of protest across China involving citizens aggrieved by local injustices, a demonstration by around 300 AIDS victims outside the headquarters of the Henan provincial government late last month might have seemed routine. 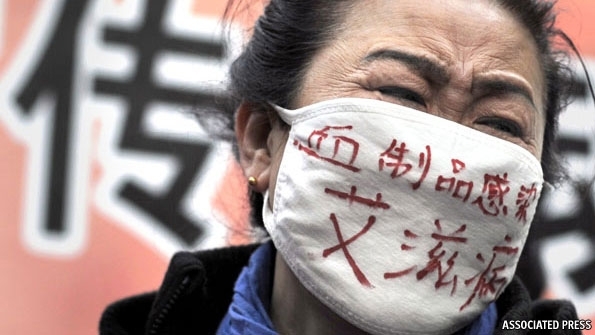 But the protesters’ growing frustration worries officials far beyond AIDS-wracked Henan. As the Communist Party prepares for an imminent leadership change it is more than usually anxious to keep the AIDS scandal quiet. “The government is procrastinating, covering up and clamping down,” says an activist who joined the protest in the provincial capital, Zhengzhou, on August 27th. His son was found to be infected with HIV, the virus which causes AIDS, at the age of six after a blood transfusion at a Beijing hospital a decade ago. Many of the other participants were infected in government-backed blood-selling schemes in the 1990s. Donors, mostly poor farmers, were re-infused with pooled blood once its plasma had been removed. Tens of thousands contracted HIV this way. The government has never admitted responsibility. Interesting global health issue – those diagnosed with AIDS in China are viewed with the same negative social stigma as those in the United States. However, those in the Henan province of China have an additional burden: many of their infections are rooted in government-supported blood-selling schemes for low-income citizens in order to make some extra cash. It’s clear from incidents like these that AIDS is not simply a health problem: it is a problem that penetrates deeply into the socioeconomic structures of society, affecting those at the bottom dramatically more than those at the top.